Public announcement: GIVEAWAY below…be sure to check it out…it’s a fun one! If we could have Sunday brunch together, this is what I would be serving. This dish is winter meets spring, with eggs slow cooked in tomatoes, artichokes, and cheese! Then topped with fresh greens and served alongside crusty bread. Honestly, nothing better. Sometimes I feel like we all just need a little reminder about the beauty of simplicity…aka simple ingredients and a simple cooking method. Molly Gilbert’s new cookbook One Pan & DONE has reminded me of that. 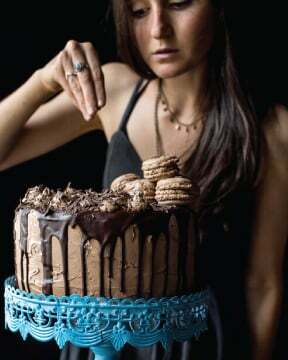 When her cookbook arrived on my doorstep the other day, I did a little jump for joy. I mean, the title alone had me very excited, healthy ONE pan & DONE. Yes, yes, yes! Sounds like my kind of cooking! 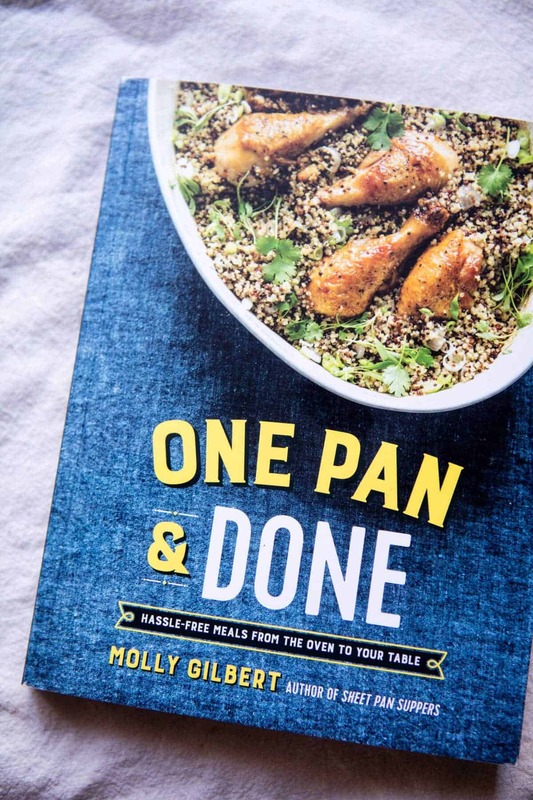 Just like the title suggests, all of the recipes in Molly’s book require just one pan. It could be a skillet, sheet pan, muffin pan, cake pan, or even a dutch oven, but all of the recipes require only one pan. Meaning easy cooking and very minimal clean up. Yup, I’m sold. Shakshuka is my go-to, fast and easy meal…breakfast, brunch, lunch, or dinner, this dish will always please. When I saw the recipe for artichoke Shakshuka, I knew I had to make it. If I could, I’d add some form of eggs to just about every savory meal. Fried, hard-boiled, soft-boiled, poached, over-easy, I love them all. Shakshuka is a traditional Middle Eastern dish consisting of eggs baked in a spicy red pepper and tomato sauce. Molly’s version uses artichokes, which I absolutely love, and it makes this easy one pan meal perfect for entertaining, especially as we enter into spring! 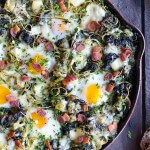 As I mentioned this is a great breakfast and brunch recipe, but it serves equally well as a quick cooking family style dinner…or in my case solo dinner with leftovers for breakfast…cool, cool. GIVEAWAY has ENDED. 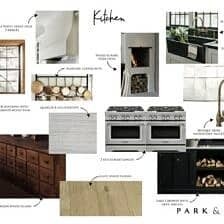 To Enter: leave a comment at the bottom of this blog post telling me your very favorite one pan dinner from your line-up of everyday recipes. I’m dying for new ideas, so I can’t wait to hear what you guys are cooking up using just ONE pan. The giveaway will end exactly one week from today on Saturday March 18th, giving you plenty of time to enter! In the meantime, I really hope you’re all able to try out this delicious Shakshuka recipe. 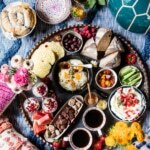 It’s the perfect weekend brunch…and it’s totally Instagram worthy as well! Reprinted with permission from One Pan & DONE by Molly Gilbert. 1. Preheat oven to 375 degrees F. with rack in center. 2. Heat olive oil in a 10 inch cast-iron skillet over medium-high heat. When oil is shimmering, add onion and bell pepper and sauté until beginning to soften, about 5 minutes. Remove pan from heat and add marinara sauce and artichoke hearts. Crack eggs into sauce and sprinkle with generous pinches of salt and pepper. Sprinkle crumbled feta or goat cheese over pan. 3. Transfer pan to oven and bake until egg whites are set but yolks are still slightly runny, 15 to 20 minutes. Scatter parsley over top before serving warm from skillet, family-style. ps. 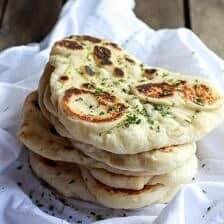 serving up a side of homemade naan is highly recommended. 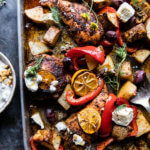 Best Easy Greek Sheet Pan Chicken Souvlaki and Potatoes. 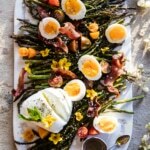 Sesame Roasted Asparagus, Egg and Bacon Salad. My fave one pan dinner lately has been a black bean and kale stew, to which I might add some spicy sausage or eggs, or nothing at all. It already has carrots and leeks and chilli and fresh cilantro and tomatoes, so it’s packed full of goodies. SO easy to make, just throw it in and let it cook, perfect for those days when I’m rushed off my feet. There’s a recipe at my blog, if you care to check it. Wow that looks so yummy! Thanks so much for sharing Ruth, I’ll have to try it! My kids love skillet hash with eggs cooked in little wells. Perfect one pan dish! Sounds so good for breakfast! YUM! I like to think so! Thank you Barbara! I do love Shakshuka, but my favorite one pan meal right now is Spinach and Salmon Curry from the cookbook Made in India. Saute spices and onion, add some diced tomatoes, wilt a ton of spinach then nestle in some salmon chunks. So good! That sounds amazing!! I might just have to try that one! Thanks Asa! The recipe looks delicious! I love the addition of artichokes to the usual recipe. I have not made shakshuka – I keep meaning to try it and this gives me the incentive. My one pan meals tend to be sheet pan roasted meat-and-veggies, or fried rice in a wok. I am excited that there is a whole cookbook for one pan dishes. Thanks for sharing! Ooo fried rice is always a great dinner!! Thank you so much Lori, I hope you like this recipe! Wow sounds so good and so creamy!! Thanks Lea! My favorite one pan (not exactly a pot, so I hope this counts 🙂 )meal is throwing all the veggies (currently obsessed with brussels, carrots, onions) and chicken sausage or whatever meet on a sheet pan with some cooking oil and throwing it in the oven! YES! I do this sometimes too and its delish! Thanks Mollie! My current favorite one pan dinner is something I made the other night. I took a small Cornish hen and roasted it for an hour. Halfway through, I stuffed it with chopped up garlic cloves and olive bread and then bathed it in dry white wine and water. I seasoned with rosemary and pepper. It was heavenly and so easy to clean up! P.s. Love the idea of adding artichokes to shakshuka. I have a ton of canned arthokes in my pantry, so this is definitely going to happen! Wow come make me that dinner haha! Sounds super yummy Sabrina! 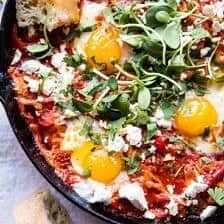 I hope you love this shakshuka! Favorite one pan dinner has to be Pork Tenderloin, seasoned and roasted in the oven with a couple of different veggies on the same sheet pan. Ooo yes pork tenderloin is so good! Thanks Lisa! Dinner in the dish! Hamburger, noodles, corn and tomato sauce. Can’t go wrong! I bet! Sounds so good! Eek! 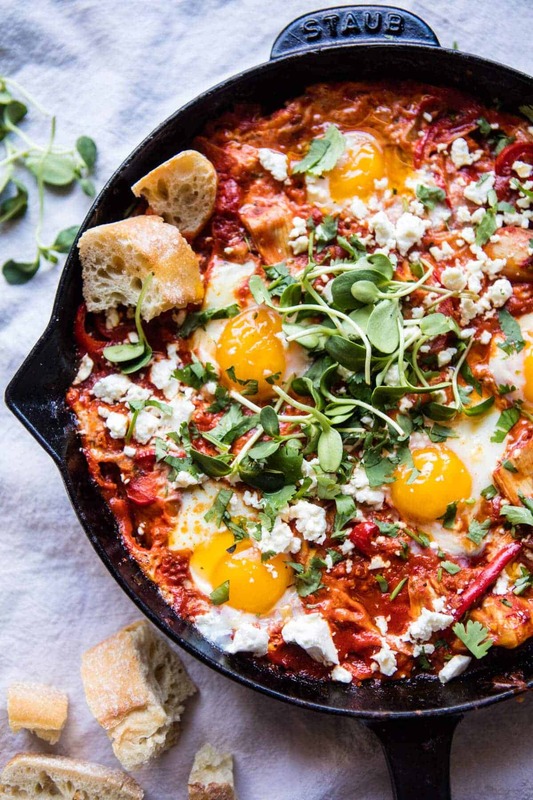 This Shakshuka looks amazing! My favorite one pan dinner is super simple, but so tasty – chicken with asparagus, seasoned with fresh lemons, a pinch of salt, & black pepper. Simple dinners can be some of the best! Thank you so much Gabi, I hope you love this recipe! I love the addition of artichokes! My current fav one-pot meal couldn’t be simpler! Freshly cooked al dente spaghetti + fresh tomato sauce + freshly grated Parmesan + fresh chopped herbs + drizzle of olive oil, s&to. Done. Devour. Fresh tomato sauce = 1 whole tomato per serving. Wash tomatos. GRATE the whole, unpeeled tomato on large hole side of box grater (bottom-side first). As you grate it, the tomato skin stays in your hand and the tomato flesh and juice falls into pasta. Discard remaining tomato skin. Dive in to greatness. YUM YUM YUM! Sounds so great, Marina! Thanks! That sounds so good! Changing up spices is awesome cause you can make it different every time. Thanks Kristina! My favorite is actually a soup – southern chicken ‘n dumplins! To make it super easy, I often use a rotisserie Chicken and a can of buttery buscuits. So good! Awh yes soup is such a great comfort food and add dumplings… wow! Thanks Daniel! My favorite one-pan recipe is my paleo Dutch baby that I make in my cast iron skillet. It also only uses one bowl! 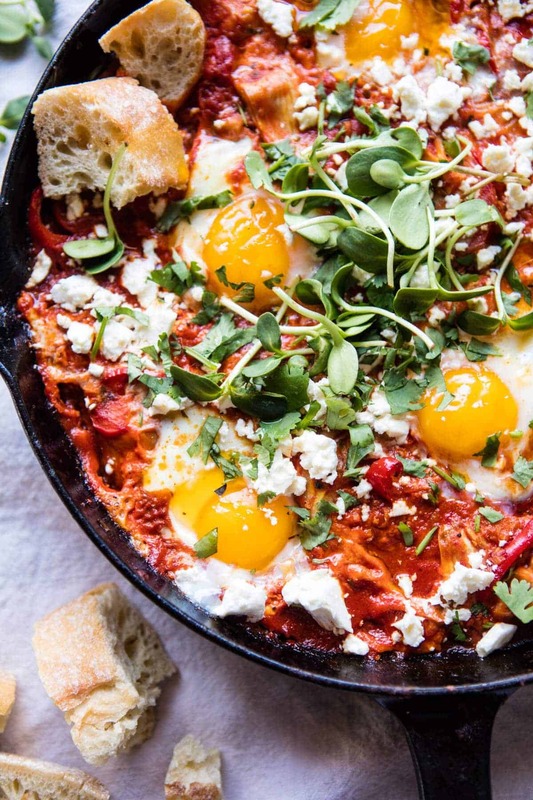 This shakshuka looks awesome. I love artichokes in anything and love regular shakshuka, so of course I can’t wait to try this! Thank you so much Becky! I hope you love this recipe!! Shepard’s pie in the Dutch oven. Love that thing! I will definitively try this dish. My favorite one pan dish is also in a slow cooker . Super easy pulled pork. Nothing to do. Put pork in the slow cooker and cover with root beer and fews onions. Let it cook all day at low. 45 minutes before you are ready to eat, drain the root beer and add a bottle of your favorite bbq sauce bottle. Enjoy! A good meal with nothing to do really except wait ;-). Ooo sounds so good! Thanks Marie! Sounds so yummy!! I may just have to try this one for my brothers since they love meat, haha! Thanks Jenna! You can never go wrong with the St. Patricks Day corned beef and cabbage! (I like it with some Irish soda bread.. so good)! I hope you love this Shakshuka & added mushrooms sounds great, Sandra! Thanks so much! The Persian lentil stew from Food52 is my favorite canvas for a one pan meal right now…the stew is so simple and flavorful that of course I mess with it by A) stirring in a bunch of kale, B) starting off by browning some sausage and building on top of that, C) chopping up a bunch of colorful peppers with the onion, D) doing it in the Dutch oven and throwing it in the oven to finish with a few eggs cracked in it for a PERFECT meal, or all of the above. You can’t go wrong, and it’s so good and so filling with those yummy and nutritious brown lentils! Cilantro Lime Chicken and Rice is a one pot meal that is so good. Just yummy. Ooo so simple but so yummy! Thanks so much Judy! I love your One-Pan Four Cheese Drunken Sun-Dried Tomato and Spinach Pasta Bake! I have made it several times and I never get sick of it. I like how I just dump the pasta into the dish without cooking it, and it comes out of the oven perfectly al dente! 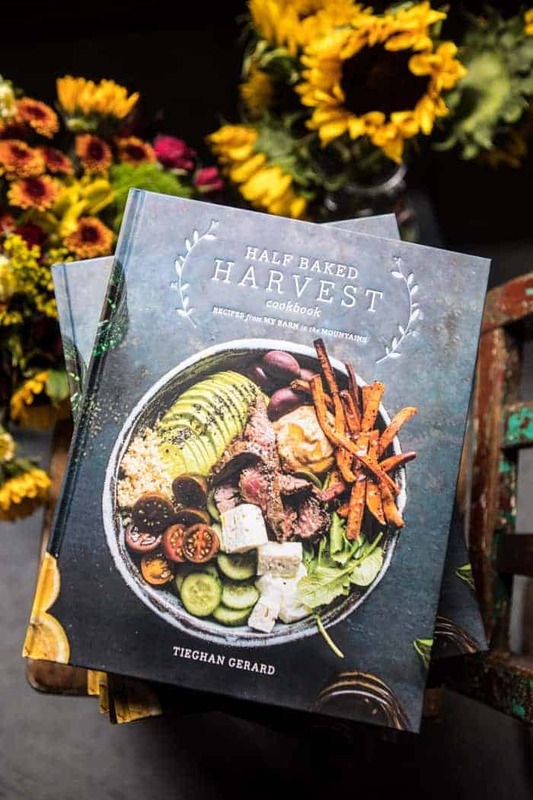 I cant wait to buy your cookbook! Pasta is always a great one-pan meal!! Thanks so much Kendra! Ooo yum! I may just have to look into that one, haha! Thanks Laura! Riff on a recipe I found in an old Gourmet magazine. Chopped onion, ground beef, tomatoes, bell peppers, corn kernels, and rice or quinoa. Top with grated cheese. Easy, rustic comfort food for quick week-day dinner. Love your blog and family stories. That sounds so delicious! Thank you! Basically anything and everything from Martha Stewart’s One Pot cookbook. Besides your blog, that’s my go to spot for easy, weeknight inspiration! My go to one pan recipe is a simple veggie pasta with onion, garlic, basil, and lots and lots of tomatoes! So delicious and easy to make. You can spice it up with kale or other veggies and a protein. Love your recipies! Ooo yes definitely sounds like an awesome one pan meal! Thank you so much Arshin! My favorite one pan dish is some quick and easy green curry with loads of veggies. I suppose if I have to make rice then it’s not quite a one pan dinner but I usually make green curry when I already have some leftover rice to use up. This recipe looks so delicious and cozy! YES!! Green curry is one of my all time favorites and loaded with veggies makes it even better! Thanks so much Emma! homemade pizza is my favorite one pan dinner! Yes definitely one of the bests! Sheet pan roasted pork tenderloin with all the seasonal roast vegetable trimmings! Frittatas are my one-pan go-to! They are so good! Thanks Lynn! A favorite for me is always a shrimp scampi situation- butter, garlic, lemon, wine, and some broccoli & tomatoes. 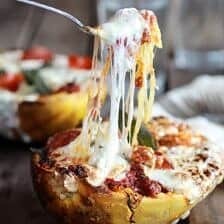 It’s sooo good over spaghetti squash with lots of parm! Either that, or a healthier take out style fried rice I make often! Some of the bests! Those both sound so so good Sara!! YUM! This sounds so good and obviously the more cheese the better in my opinion haha! Thanks Natala! First of all, as always – this recipe looks amazing! The answer to “what’s for dinner?” is answered by your website about 85% of the time (pizza or just simple pasta making up the other 15%). One thing we make that isn’t a HBH recipe is garlic broccoli pasta – easy, one pan (and a colander eek). Roast garlic ahead of time. Boil campanelle pasta; with about 6-7 minutes left, add chopped broccoli. When done, drain into colander (don’t rinse, you will lose some of the broccoli goodness!). In the pasta pot, melt butter and roasted garlic with salt, pepper, and red pepper flakes – smush the garlic into the butter to make a paste. Return pasta and broccoli back to the pan and mix – the broccoli breaks down a little bit to give the whole thing a pesto-look. Sooooo delicious!!!! Amounts totally depend on taste and number of people. For two of us, we use 1 box of pasta and 2 large or 3 small heads of broccoli – this gives us enough for dinner and leftovers! yum yum yum! This sounds so good Nikki, thanks so much for sharing!! Oh and I love broccoli in pasta! geez I’ve made shakshuka many times before but didn’t know it had a name. I thought I had invented something!!! LOL My current fave for one pan dinner is quesadillas baked in the oven. They get really puffy, golden and crispy. The filling is whatever is in the fridge….spinach, bacon, goat cheese/any cheese, beans, salsa…. Ooo sounds so yummy! Thanks Tiffany! Can I choose nachos as my favorite one-pan meal? Because, I’m thinking nachos are the best right about now. I don’t eat meat so there’s no need to dirty a pan browning any beef. Just smash some black beans with cilantro/lime/spices, load up the chips with plenty of sharp cheddar, salsa, jalapeños, and top with more cilantro, avocado, and scallions when they come out of the oven. That sounds so good!! I don’t know if you eat eggs, but adding scrambles egg whites is yummy too! Thanks so much Chelsea! My favorite one pot meal is giambotta. Thanks. My favorite one pan dish is actually dessert. Making an gooey chocolate chip cookie in an iron skillet is pure happiness. Add a drizzle of caramel sauce and a scoop of ice cream. Grab the family and some spoons. YES!! Can never go wrong with this, its just so delicious! Thanks Kathy! Harissa chicken thighs with roasted potatoes, arugula and yogurt. My favorite one pan dinner lately is sheet pan chicken and potatoes with carrots and garlic. So good and so easy. Sounds like it!! Thanks Steph! My current favorite one pan dinner is chicken roasted with fennel, lemons, onions, garlic, and brussel sprouts. Yum! Btw, I absolutely adore your blog. The recipes are always so creative with really interesting ingredient combos! And, the photography is always stunning. I’m a foodie who is currently in college and I’m thinking I may want to do a photography minor partially after being inspired from your photos!! Sounds so good! Thank you so much Emma, that is really sweet! You should totally do a photography minor, I’m sure you would love it! Definitely making this for dinner tomorrow! My favorite one pan dish lately has been frittatas. Throw in any veggies that need to be used, top with feta and sprinkle red pepper flakes. I LOVE it! Frittatas are so good! Thanks so much Abigail, I hope you love this dish! I love making chilli in a crock pot and letting it simmer all day. My favorite one pan dinner is making a curry with whatever I have in the fridge and pantry. I love taking the left over vegetables and chickpeas and using spices such as turmeric, coriander, cumin, garam malsa. Then adding a little some coconut milk for some creaminess. That sounds awesome! Thanks so much Emily! Ok not really a meal per-se but my recent go-to one pan food is some baked feta with olives , tomatoes, fresh parsley, oregano, garlic, red onion, and olive oil. So good with some crusty bread or crackers!! Love your blog and I’m definitely trying out this recipe soon! Oh wow sounds super good! Thanks so much Kourtney, I hope you love this recipe! Seared scallops with Parmesan Risotto! Yum! Simple and delicious! Thanks Tamra! Not a traditional or nutritious dinner, but I really like making a skillet brownie with Oreos and cookie dough! But this sounds like a great dessert!! Thanks so much Martha! I make a killer good one skillet chicken pot pie! I use puff pastry for the crust….. it’s so good! YUM! Thanks so much for sharing, Sarah! YUM! That sounds super good! Hi! My favorite one pan meal is an everything in the fridge frittata. It has eggs it has veggies and of course it has cheese! 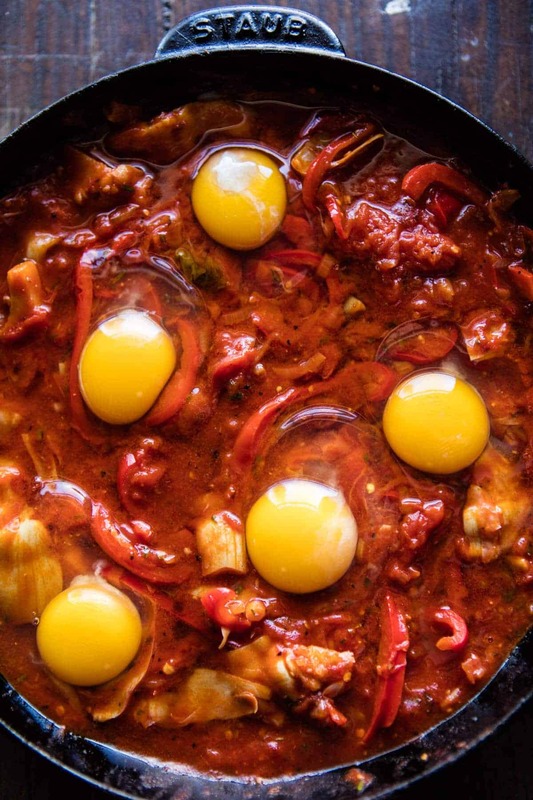 I adore Shakshuka, and I love that this recipe has artichokes! Always a great meal when you can just use up what you already have! Thanks Cassandra! Yes, this is the perfect spring brunch! Glad you are loving it, Laura! Thanks! My favorite one pan dinner is balsamic chicken with sun dried tomatoes, artichoke, and lots of rosemary. That sounds super good! Thanks Julia! 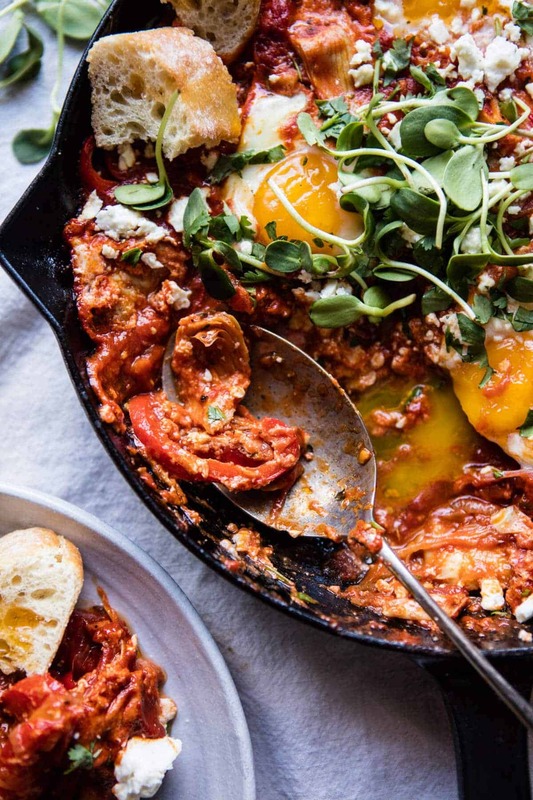 I love shakshuka and will try this recipe soon! It looks amazing! I hope you love this recipe Ana! Thank you so much! Love this! My fav one pan meal is your sweet potato and black bean nachos. I mean, they are just SO good! I am so glad you love those! Thank you Maegan! You can’t go wrong with Kushari which is something I first tried in Egypt. So comforting! Ooo yes that sounds so good! Thank you Susan! This looks delicious! My go to one-pan meal is Mexican Quinoa from the website Damn Delicious. It comes together so quickly, and it’s full of healthy/filling ingredients. Perfect for meal prep too! I love one pan meals, one of our go-to meals is a three cheese mac & cheese with bacon. Mac and cheese is so yummy and a great one-pan meal! Thanks Corissa! My favorite is a one -pot lentils and angel hair spaghetti dish, so satisfying. Sounds like it! Thanks for sharing Karen! This looks super yummy! My favorite one pot meal is beef and broccoli for an Asian fix that’s much better than takeout but still just as easy 🙂 I love your blog so much thanks for all you do!! Beef and broccoli is so yummy! Thanks Brooke, I am so happy you like my blog!! My favorite one pan meal is a cajun pepper and pineapple rice with chicken that is so flavorful and so easy! My favorite “one-pot dinner” is something I’ve been making since high school! Sauté chicken breasts in a big pan with sliced mushroom. Once everything is slightly browned, throw in a handful each of halved pimento-stuffed green olives, thinly sliced lemon rounds, chopped celery, and cherry or grape tomatoes. Pour a thing of chicken stock on top (and if you’re me, you add a healthy dose of red pepper flakes) and cover it til it boils… reduce to medium and add some orzo to the mix before covering again. Once the orzo is cooked through, serve up on plates with some feta cheese and toasted pine nuts or pumpkin seeds on top… voila! Sounds super delicious Elizabeth! Thank you! Yum yum yum! Sounds so good! Thanks Cami! Oh wow! That sounds delish! Thanks Beth! My favorite one-pan dinner is Chicken with Caramelized Onion and Cardamon Rice. Perfect combination with excellent spiced flavors. Sounds so yummy Julie! Thanks for sharing!! Sounds like a great dinner! Thanks Sara! That is so awesome! I am so glad you love that, Tanvee! Thank you! My favourite one pan meal right now is cauliflower fried rice with lots of veggies 🙂 Can’t wait to try this, it sounds delicious! Such a good one!! Thanks so much Shannon! My favorite one pan meal is Turkey Chili. It’s quick, easy & delicious! My favorite one pan dinner is (and this sounds strange) broccoli lasagna! Pasta, cheese, broccoli and lots of veggies covered in marinara sauce baked to perfection. Mmm! Ooo yum! Doesn’t sound strange it sounds super delish! Thanks so much Taylor! frittata’s, with asparagus and goat cheese <3 although anything breakfast is sold on me! can't wait to try this shakshuka though – the artichokes sound amazing! Thank you Candace! I am so happy you are loving this & that frittata sounds so good! Oooh yum! I’m super into a simple curried lentil soup. You can add in any veggies you have handy and somehow the process of cooking just makes all the flavors come together. So good! Curries are a go-to one pan dish for our family – and they’re also an easy way to use up leftover bbq meats. My parents recently brought me some masalas from Sri Lanka, and the amazing aromas got me wishing Sri Lankan food was easier to find! That sounds so amazing, I would love to have some of those spices in my kitchen! I’m really glad you like this recipe, thanks so much! That looks SO GOOD! My easiest one pan dinner is very simple and easy (which works for me with a full time job and being a mama). I put small potatoes (Little Potato Company grows my very favorite), green beans or asparagus, and chicken breast or salmon on a pan. I drizzle with butter and olive oil, then either ranch dressing mix or Italian dressing mix and bake at 375 until it’s done. It’s easy, yummy, and even my picky eater will eat it! Thanks so much, so glad you like this recipe! Yum this looks so good! My favorite one pan dish right now is easy tofu lo mien! it has tofu, lo mien noodles, red bell, snap peas, mushrooms, and spinach with an amazing ginger garlic sauce. WOW! Sounds like my kind of dinner! My favorite one pan meal is hot and spicy spam fried rice! Oooo! Sounds yummy! Thanks Nancy! My favorite one pot meal is actually your apple cider chicken marsala. I made it last fall and fell in love and make it whenever I can find good quality cider at the market. I spoon it over leftover brown or wild rice so it fits the one-pot lifestyle! So good–and this artichoke shaksuka looks so good, too! I’m so happy one of your favorite meals is mine!! The way you present it sounds so yummy! I hope you love this dish just as much, thanks Alyson! Favorite one pot dish….so hard to pick! I love chili made in a giant cast iron pan…I add in weird things like lentils, sweet potatoes, chocolate, coffee, and/or beer to my chili to give it extra depth…And of course lots of toppings because i LOVE toppings! Ooo I love that you add different things to your chili! Thanks so much for sharing Rachel! Shakshuka is one of my favorites! I love breakfast foods and especially eggs, so my favorite one pan dish is a hash with potatoes, onions, and peppers. Conveniently, it’s almost Saint Patty’s day so I would throw some corned beef in there as well, and then cook an egg in the midst of everything. Sounds so yummy, and what a great idea to add in the corned beef for St patricks day! I may have to add this into my meal! Ooo sounds so good! Love everything Pasta and mozzarella balls are one of my favorites! I love making a giant egg bake to eat throughout the week. Also, baked oatmeal is great and easy! Agreed! Love breakfast food! Thanks Erin! That sounds so so yummy, I’ll have to try it! So glad you are loving this recipe too, thank you Lell! This is one of my favorite meals to make when I have a little leftover red-sauce. Well, not this exactly. It’s far less exciting. I can’t wait to make this following an actual recipe! My favorite one-pot meal in our house is the insanely simple/ insanely simple Sausage and Kraut. It’s what we make when we are very hungry and don’t feel like cooking. Simply brown slices of smoked sausage and then cover with good quality saurkraut and warm it all through. It takes 15 minutes tops and I feel like it has such an incredible ratio of effort to flavor. Simple but sounds yummy! Thank you so much Libby, I hope you love this recipe! Yum yum yum!! That sounds so good Ashley! Thank you! This recipe looks amazing, cannot wait to try it! Favourite one pot meal (especially if i’m in a rush): any type of pasta I have on hand (butternut squash ravioli, if I’ve thought ahead), peas (frozen or fresh) and boursin cheese . That sounds so good Kyla! Thanks so much for sharing!! My favorite one pan meal is tortilla and eggs. Not really a recipe just eggs scrambled, with peppers and onions if you like, then add flour tortillas cut into thin strips. Mix the whole thing together in the pan to warm through then add shredded cheddar or Monterey Jack on top. So yummy for those nights when it seems too late to even bother with dinner. Sounds awesome and perfect for an easy dinner! Thanks Karen! Molly, this dish is everything!! One pan dinners are a life saver, aren’t they? When I’m feeling really lazy, I’ll layer onions, Brussels sprouts and carrots on a sheet pan, and lay chicken thighs over them and roast everything in one shot. I mix it up by putting olive oil, balsamic, or whatever other marinade I have laying around, and it’s really hard to mess this dish up. Boom, done! Sound SO GOOD! Thank you Kira! the best one pan meals are soup in my opinion! my go-to is a simple chicken and veggie soup with orzo pasta tossed in! Soups are always a great choice! Thank you Laura! My favorite one pot is Pork Tenderloin cooked in Cranberry Sauce, Orange Juice w/powdered cloves… done in the Slow Cooker! Delicious! We always make double sauce because it’s great on everything!!! Sounds delicious! Thanks so much for sharing this Mary!! My favorite one pan meal is sriracha and brown sugar chicken thighs over onions and small potatoes. Chicken thighs can be bone in or out, with skin or without. Salt and pepper the chicken and sear it in your cast iron or any other oven proof skillet. I do it over butter, but vegetable oil or ghee work as well. Remove the chicken from the pan and add a bit more butter. Saute the sliced onion and quartered potatoes for about 5-7 minutes. The sauce is 1/3 cup sriracha with 1/3 cup brown sugar mixed until incorporated. Spread the onion and potato evenly over the bottom of the skillet and place the thighs back in on top. Spread the sauce over the thighs. Put the skillet in the oven at 400 degrees for 30 minutes. It’s so delicious!! It sounds super delicious Ashley! Thank you so much! I’m so glad to finally have a name to put to one of my favorite kinds of dishes! My husband and I saw someone prepare it on a tv show, and we’ve been cooking up a very similar dish for years now – but I didn’t know what to call it. I love the possible variations, and will be trying artichokes in the very near future. Thanks! Ooo! Thats so funny! Love that you have been making something similar! I love doing a breakfast frittata in one big cast iron skillet. Fry some chopped up bacon fornjust a few minutes till it’s starting to cook through, then toss in some chopped up onions and mushrooms. Once everything is simmering nicely, toss in some scrambled eggs with LOTS of cheese. Mix everything together, then pop the pan in the oven until the eggs fluff up, about 20-30 minutes depending on the pan. Yum! 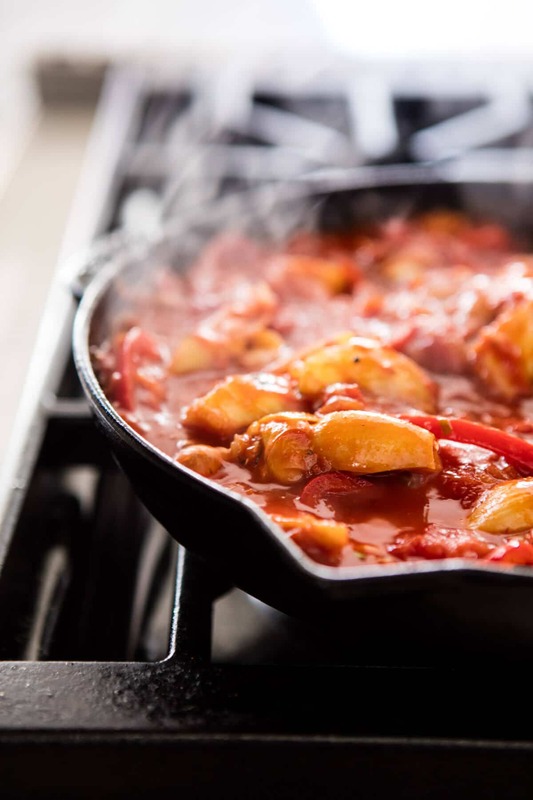 My favorite one pan dish goes in my cast iron skillet. It’s orzo with onions and tomatoes, and whatever veggies I have, diced small with tilapia or other whitefish fillets on the top. A little olive oil and seasoning on the fish and into the oven it goes. I originally got the recipe from a magazine and adapted it for my family’s taste. I love your blog and have made several of your recipes. My family loves them and they are well written and easy to follow. Wow! That sounds so yummy! hese are good foods for good health. I used it everyday, try it. Hi! I am so glad you enjoyed this recipe! I hope you love some others as well! Thanks Kelsey! hello,I want that salt lamp!!! So cool! I also need new slippers BAD. This is such a great list – gift guides are the best because there are always ideas I would have never thought of! So glad you like this! Thank you! I have a question! 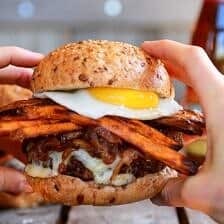 I have made this recipe before and I LOVE it! I’m test driving it tonight in mini-version for myself one more time before cooking it for a brunch party tomorrow. The only thing that is not turning out quite right is the egg yolks. In your photo, they sit right on top and look nice and bright and yellow. The two times I’ve made it the yolks end up sinking slightly under the whites to they’re covered after cooking and you don’t get the same visual effect. Any ideas for how to fix that? 🙂 Thank you!